As so many of us feared and expected from a judicial system that often mirrors Sodom rather than Sinai, Sergeant Elor Azaria was convicted of manslaughter. To put it bluntly, a Jewish hero may sit and rot his finest years in prison, possibly twenty years. It is a monumental disgrace, a travesty of injustices to rival anything this country has thrown at decent Jews in the past. Even if Elor is pardoned, the shame of the verdict, of the Bolshevik investigation and kangaroo court which tarred and feathered him from day one, these will never be erased. In a time when the word Maccabee is thrown around with glibness, often attributed to those who deserve it least, the State of Israel, indeed, the Army of Israel itself, publicly lynched a genuine Maccabee. Today is a dark day in Jewish history. Yet another nail in the coffin containing the remains of Jewish dignity and self-respect. "What happened in Hevron does not represent the values of the IDF. The IDF expects its soldiers to act with self-control and in accordance with the open-fire regulations." In any event, as shameful as the conviction is, the most important thing is to ensure that Azaria never sits a day of this perverse prison sentence. Bestial? Antithetical to IDF values? What of Torah values? The most noble thing on earth is to put a bullet in the head of a terrorist who just tried to murder Jews. Whether upright or twitching and bleeding on the ground. Imprisoning these beasts is immoral. In Judaism, we destroy our enemies. We certainly don’t warehouse them, educate them, and then release them to murder other Jews, as so many other terrorists have been in the past. And without a doubt, some future unprincipled craven Israeli government would have released this beast, by stating that he had no blood on his hands. Having failed in his first attempt, this Amalekite would have gone out and ensured that he was successful the next time around. So even if this creature wasn’t laden with explosives, even if Azaria wasn’t concerned with this possibility, his actions were supremely Jewish. Matityahu would have been proud of him. In Israel, the uncompromising warrior is often treated like a fiend, or a lawless vigilante. A soldier such as Elor Azaria who kills an Arab terrorist is a hero, and any "Jewish" government that punishes such a warrior is reprehensible. I don't care if the creature was trussed up like a Thanksgiving Turkey. Or whether the ghoul had an explosive. A bullet to the head is the Jewish response. You can bet your last shekel that King David would have agreed. 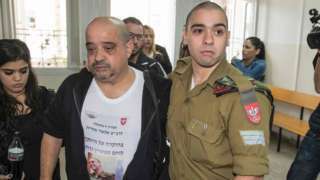 The witch-hunt against Azaria shrieks of Jewish degradation. Such actions are the antidote to Jewish funerals. This is nothing new in a country where soldiers are increasingly afraid to use their weapons against genuine Arab threats, or in more extreme lunatic situations, are given standing orders to retreat in the face of murderous Arab violence. Where soldiers are indoctrinated with the accursed self-restraint “ethic” which permeates every normative party in Israel, and stands as an ideal in the hearts of so many military men. Sometimes the decision is to be murdered or maimed, or do the right thing by putting a bullet (or several) in the fiend’s cranium. And then face the real danger of prison sentence. As my good friend, Moshe pointed out, Secretary of State John Kerry’s recent statement mirrored the unintended action of the evil Balaam’s curse. Kerry intended to demonize and vilify Israel by arguing the incompatibility of a Jewish State or democracy. His intention and desire was certainly malevolent, a vindictive expression of Obama’s (and his own) Jew hatred and a desire to alienate and isolate Israel. And yet unlike the belief of too many Jews on both sides of the spectrum, that his assertion was false and that a marriage of the two is workable, without even realizing his statement, John Kerry was correct. The great Rabbi Meir Kahane (may G-d avenge his blood) often stated the exact thing, and unlike Kerry he knew precisely what he was talking about. The most rudimentary definition of democracy would be the majority opinion or will of what the populace believes to be true or desires. Torah deems the majority opinion of the great halachic minds to be the ideal. Democracy accepts the possibility of an Arab majority, or Arab interests superseding those of Jews. A Jewish state cannot without endangering and ultimately compromising its existence. Even a secular “Jewish” state cannot abide this possibility for reasons of logic. From a halachic statement, the question of who can even be in the country has rigid rules and requirements. Certainly, the Halacha denies even the noble resident stranger (and today’s gentiles in Israel are certainly not) from having any say on matters of State. In Israel today, the leadership behaves towards Jews in a manner that is neither Jewish nor democratic. It is tragic that we are so far from a true expression of Halacha in the State of Israel. We will surely bleed because of it. But neither do we have a functional democracy, since witch-hunts, administrative detention, and the immoral torturing of innocents are anathema to the former. And a country that punishes her own soldiers for terminating an evil enemy who intended to create orphans and widows, expose their worship of a modern-day Baal on the world stage. The Baal of moral relativism and pacifism. Where are the Maccabees today? Hard to say, since our times are exceedingly unromantic. Your average middle aged 30-year-old has no chance to pick up a gun in defense of country, despite his desire to do so. We have a repressive government acting within the well-constructed veneer of democracy. Zealotry lacks the catalyst in the contemporary scene. Unless the roof caves in, a revolution seems unlikely at this point until the inferno gets out of control. There may be a tipping point in the future, as there was once upon a time in the town of Modi’in. On that day, a zealous warrior decided that he had enough of the perversion and he started a Torah revolution. In the meantime, we know of at least one such Maccabee in Israel today. Stg. Elor Azaria is a Maccabee in the truest sense of the word. May he be freed soon enough.